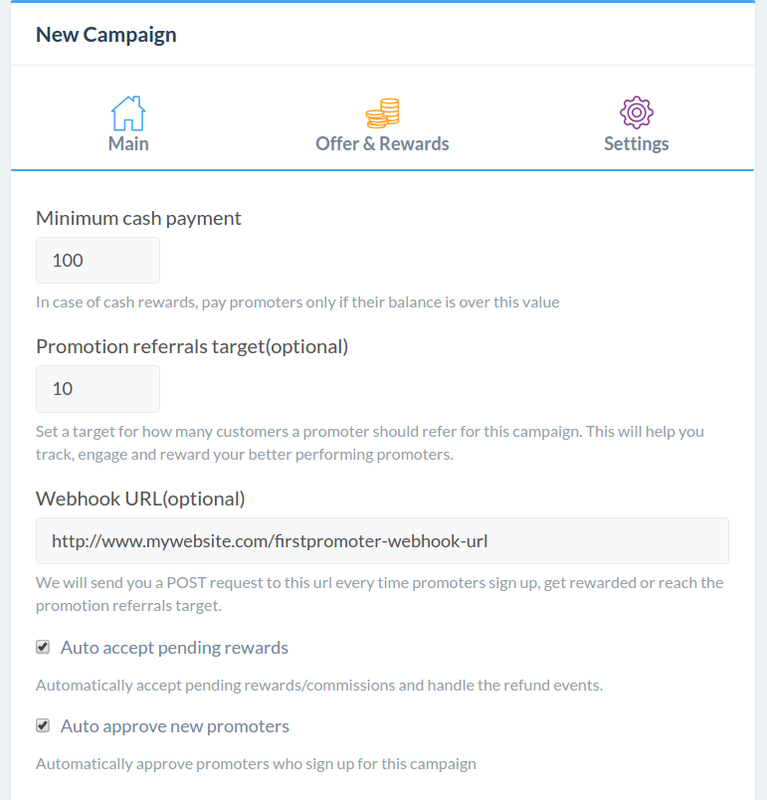 FirstPromoter allows you to set any type of rewards for your promoters, depending on what motivates them. For example if you have a credit based pricing, you can give 10 credits for each customer they bring in. With the exception of monetary rewards, you need to make the rewards your promoters earned visible in your application and attributed to their user accounts on your system. To achieve this you need to use our Campaign Webhooks feature, which will send notifications to your server each time a promoter is created, gets rewards or payment/fulfilment is made. Create a webhook POST route for FirstPromoter in your application, like https://mywebsite.com/firstpromoter-webhook-url and add the URL in the Webhook URL field in the Campaign Settings tab(see below). Note: This step can be skipped if you use the API to create the promoters. More details here. Create a function to append your logged in user/customer ID from your system to that link as "cust_id" query parameter. You can see that you can append multiple fields to that url which will pre-fill the promoter sign up fields - a good way to reduce friction. The most important is "cust_id" parameter though. Use that function to generate a link and place it on your app dashboard or other places visible to your users. You can call it "Refer a friend and get 1 free month" or whatever feels appropriate. When your users sign up to the referral program, the "cust_id" parameter will be passed along and we'll have a way to match the promoter details from webhooks to your customer. If you set only rewards per referred sale when you created/edited the campaign, follow a). If you also set an "offer" for promoter's friends and followers, follow b). Check the payload format of fulfilment_pending webhook. Create the procedure in your system to handle the webhook call with a condition to execute only if the event type from the payload is "fulfilment_pending"
Use the "cust_id"(which was passed on promoter sign up) value from the webhook to find the user/customer to reward and apply the reward. You also have an "amount" value in case you set different rewards for different campaigns or promotions. It's up to you how you apply the rewards to the users, for example, for Stripe you can apply a negative invoice item or a 100% discount code to the Stripe invoice in order to give a free month. Return a 200 status code if everything is successful. Return 2xx(except 200), to skip the fulfilment(it will remain in pending state) and other status in case of error/you want the webhook to be retried later. For this, you need "lead_signup" and "fulfilment_pending" webhooks. Check the payload format for lead_signup webhook. Create a procedure in your system to handle the webhook call with a condition to execute only if the event type from the payload is "lead_signup". Use the "uid" or "email" value to find the user in your system. Apply the offer to your user. promotion['current_offer'] JSON can give you more information about the offer to apply, including amount and unit/type. Return a 2xx status code if the everything is successful. Something else to retry the webhook later. Check the payload format for fulfilment_pending webhook. when a promoter signs up and is accepted to a campaign, it sends a promoter_accepted notification. when a lead signs up for trial, it sends a lead_signup notification. This is mostly used when you give and offer like free credits to the user who was referred by a promoter. when a reward is attributed to a promoter, it sends a reward_created notification. when a reward is approved and sent to fulfilments, it sends a fulfilment_pending notification. when a fulfilment is marked as completed, it sends a fulfilment_completed notification. If some of the webhooks are not fired, it means they are probably disabled for your account and you need to contact us to enable them.